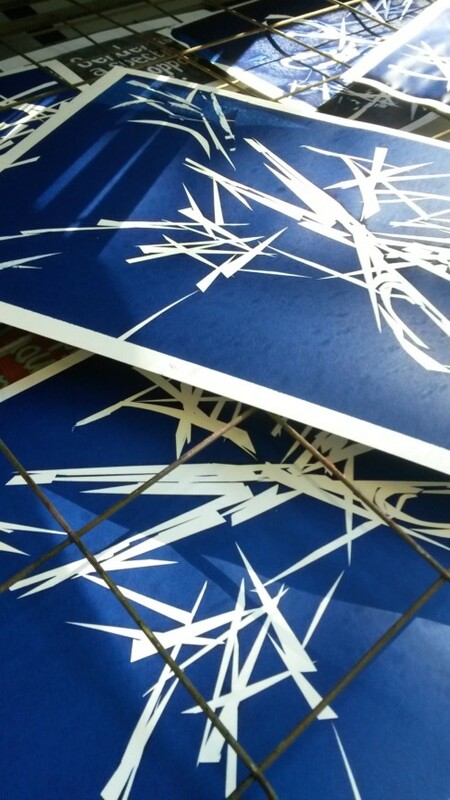 Advancing ideas around the simulacrum, and other questions concerning the copy, the original, and representation, through work produced in my artist's residency in the printmaking room at the University of Suffolk. Well, here I am again on residency. This time at Asylum Studios. I can’t speak highly enough of residencies. They are the best way to engage in your practice with all the accompanying feedback, as well as facilities, time and focus. This time it is very different, a block of time; short but productive. It is not as busy here as it was at the university but other artists are coming in and discussing my progress and ideas with me. I value that as well as the space. 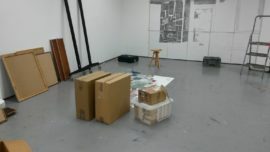 The space is their exhibition space, which is big. I could not have projected the images to locate all the items and designs without this opportunity. The project for this residency is the culmination of an eleven year exploration. Out Of The Ordinary is the title and the exhibition bringing all the work together is on show tomorrow evening as a closing view. Work from the ongoing period and new pieces completed during the residency will be on show together. Out of the Ordinary is a play on words. The subject matter is often unexpected and all the work is created in some way with use of ordinary everyday things. A few pieces were from my printmaking residency at the University of Suffolk that did not go into the Simulacrum exhibition. Some from earlier, but much of it is either ideas long awaiting completion or new ideas completed during the last two weeks. 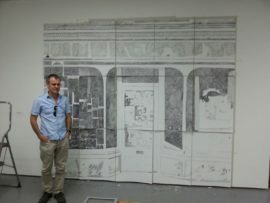 Pictured here are two pieces Empty Spaces where parts of the drawing is cut and fitted into packaging so the closed down shop front image is codified and detached from The rest. 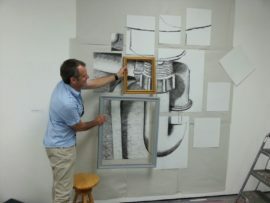 The other piece is Subject Matter where the image is to be inserted into the frames as an installation challenging expected subject matter for pictures.